She was a victim of her own mythmaking about the mysterious Orient. Shortlisted for the Arabic Booker when it first appeared in 2011, Ezzedine C. Fishere’s Embrace on Brooklyn Bridge has already been reprinted eleven times. Ahead of its English publication on 1 April, we collaborated with exciting new publisher Hoopoe to present the excerpt below. Brimming with observation, this vignette provides a searing glimpse into the life of Egyptian diaspora coming to terms with a hyphenated identity. Though he had spent five years in London writing up his doctoral thesis, he hadn’t met Jane there, but in Cairo, which surprised their small circle of friends. Jane was tall, slim, shapely, and beautiful, with long chestnut-brown hair, which she would either let hang around her shoulders or pin up with whatever was to hand, normally a pencil. She had come to Cairo for a year to learn Arabic, on some scholarship or another. She grew to love the city in all its chaos and ended up settling there. They gradually got to know each other, and grew closer until they ended up more or less living together in an apartment in Giza, behind the zoo. The thought of marrying Jane had occurred to him early on: she had many of the qualities he sought in a partner. But something about her unnerved him, so he didn’t tell Leila or Youssef about her until he was sure of their relationship. He never accepted any of her excuses, never accepted that different rules applied to Arabs. Arabs were not a corrupt offshoot of the rest of humanity. The same rules and moral standards applied to them as to anyone else in the world. Saying anything else was patronizing trash masquerading as sympathy. To accept a lie from an Arab but no one else meant you saw a fundamental weakness in them that the rest of humankind didn’t suffer from. It was treating them as if they were granted permission to be irrational. He told her this, time and time again. Her indulgence of Egyptians and their shortcomings began to aggravate him. He asked her to read their history to understand why they were just like any other people, and how they had ended up the way they had. She would then see that indulging their faults was not the solution. Treating them like responsible grown-ups was. She tolerated, even reveled in their backwardness. Jane said she didn’t have the time to immerse herself in Arab history like that. Enter Albert Hourani. When he gave her the book, she seemed pleased. She did start reading it, but soon gave up, saying it was boring and that she preferred to learn through mixing with people. But she didn’t learn through mixing with people. In fact, she slid deeper into “idiotic tourist syndrome,” as Darwish diagnosed it. This was an ongoing argument between them, as she believed the real problem was that his way of thinking barred him from recognizing any of the complications unique to Egypt. He would protest that he was born of Egypt’s soil, but he could tell the difference between complications and plain old bad behavior. In his view, Egyptians needed re-education. Whether it was because of their poverty or ignorance or poor education made no difference to him; the upshot was a deterioration in their moral codes. She would counter that he was the victim of his Western education, which had planted in him this naïve idea that people could be reformed through argument or appeals to conscience. That’s why he fought with everyone all the time: because he preached at them instead of trying to understand them. He would laugh and ask sarcastically whether that was an insult or a compliment, and her face would redden. That really irked him. He felt he was involved with an imbecile; all she needed was to wear rags and run after a Sufi nutcase. He accused her of compensating for her failure to integrate into British life by taking a stance that allowed her to feel superior. She was a victim of her own mythmaking about the mysterious Orient. She countered that he was, in fact, infatuated with the myth of Western order. He looked at her with almost complete despair. Then he said there was a seminar he wanted to catch, and left. After this familiar argument, their life would return to its calm normality. 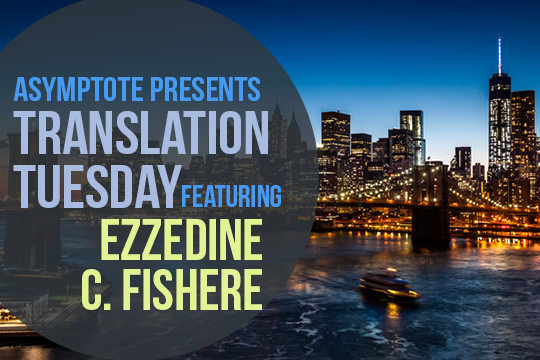 Embrace on Brooklyn Bridge by Ezzedine C. Fishere is published by Hoopoe, an imprint of the American University in Cairo Press. Ezzedine C. Fishere is an acclaimed Egyptian writer, academic, and diplomat. He has written numerous successful and bestselling novels and he also writes political articles for Arabic, English, and French news outlets. He currently teaches at Dartmouth College in the US, where he lives. John Peate has studied Arabic in Algeria, Morocco, Egypt, Syria, and Oman, as well in the UK, and has a PhD in Arabic linguistics. He has translated numerous authors’ works, has been a university teacher and a BBC journalist, and now works for the US Embassy in London as a media analyst.